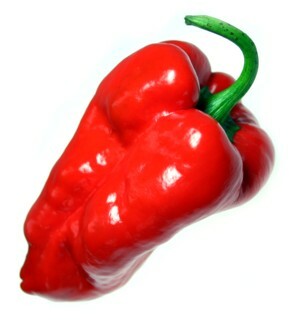 Ancho is a dried red poblano pepper, not a smoked one. Says who?! Since our poblano plants gave us some fruit nicely matured to red, we cut them in half, smoked them over mesquite wood, and finished them off in the dehydrator. Smell and taste are just incredible, and they’re just slightly hot. For me, stuff like this is so much more fun than fooling around with those superhots. How about superflavor? Here’s how we did it. Here are the fresh mature Poblanos from our pepper garden. Before cutting them in half, we washed them thoroughly. To keep the germ count down in the final product, we do this with all peppers we intend to dry. 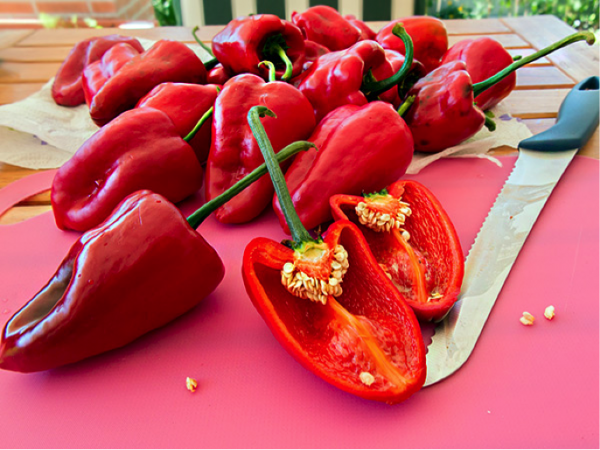 By cutting the peppers they’ll get smoke inside and out, and they’ll dry much faster. Also, we removed most of the seeds (but not all). 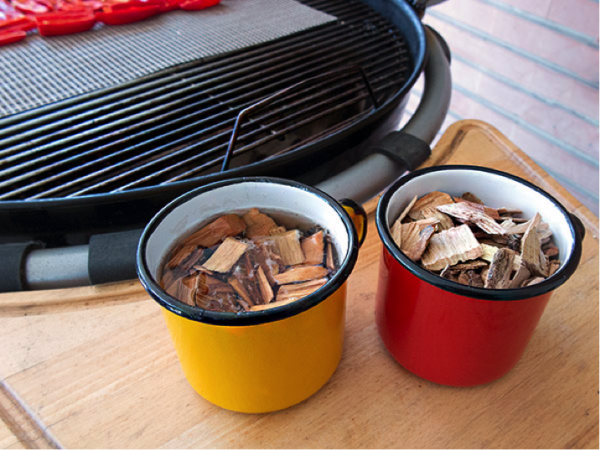 The amount of mesquite chips we used – half & half dry and soaked for 30 minutes in lukewarm water. 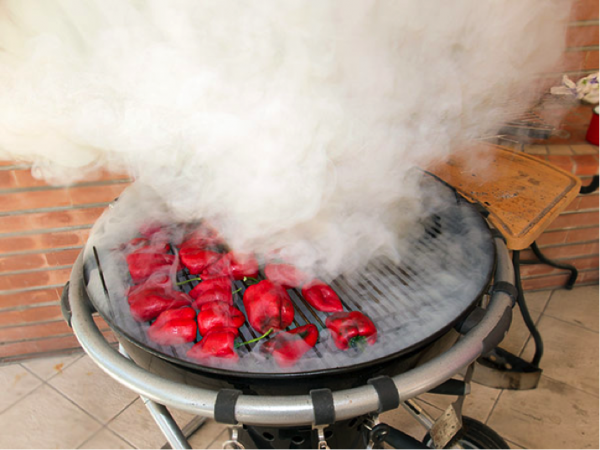 Ahhh… mesquite smoke! 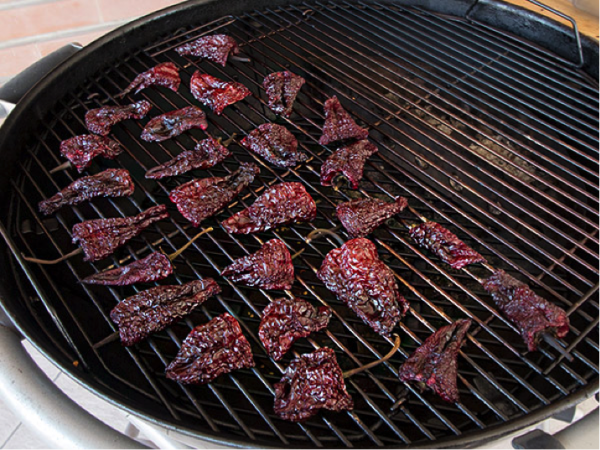 Soon after adding half and half dried and soaked mesquite wood chips to the coals, we closed the grill, of course. Note that we did not place the peppers over the coals but as far away as possible – after all, we don’t want to cook the peppers. This is what our mesquite-smoked Poblano peppers look like after 6 hours of smoke. 1/3 of a chimney full of high quality charcoal briquettes is enough to keep our kettle grill going long enough. 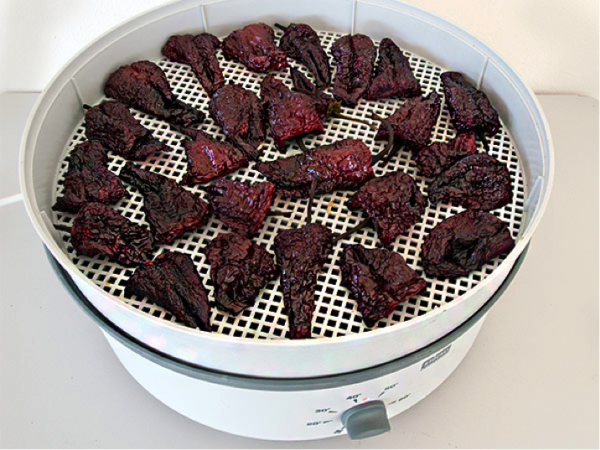 Finishing off our “Smoky Anchos” in the dehydrator at 55C (130 F) for about 8 hours until they were just a little flexible. After cooling to room temperature, we save our precious pods airtight in a mason jar and store them cool and dark in the pantry. But not for long… can’t wait to spice my next beans with these goodies! They should also be great in a home-cooked barbecue sauce.